When I write about a distillery or post a picture of it I quite like to link to the website for it. Something I can't really do for Lagavulin (or Caol Ila, the other Diageo owned distillery on Islay for that matter). While the domain www.lagavulin.com is registered to Diageo all it does is to redirect to the rather big corporate style Malts.com website. There I have to find my way to a rather bland Lagavulin page (although I have to admit the blue boat slowly passing across the bay is a nice touch). Come on, Diageo, is that the best you can do? All the other Islay distilleries have their own sites under their domains, Ardbeg, Bowmore, Bruichladdich, Bunnahabhain, Kilchoman and Laphroaig. Several of them with online communities, webcams and other interactive features. 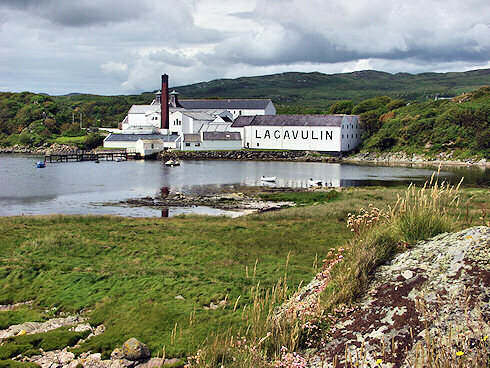 I know the people working at the Lagavulin and Caol Ila distilleries and the Port Ellen maltings are great people, can we get a website to match and complement (or compliment?) them and their work? OK, ‘rant’ over. Have a great weekend!